Booo! Does this guy scare your or what? Does he put the spirit of Halloween in you? Just think of how nice he would look sitting next to the candy bowl as you give out candy to those precious little monsters come for their trick or treats. This guy would also look good sitting on a porch with a candle behind him to light the way. Just think, no more messy clean up from a live pumpkin. 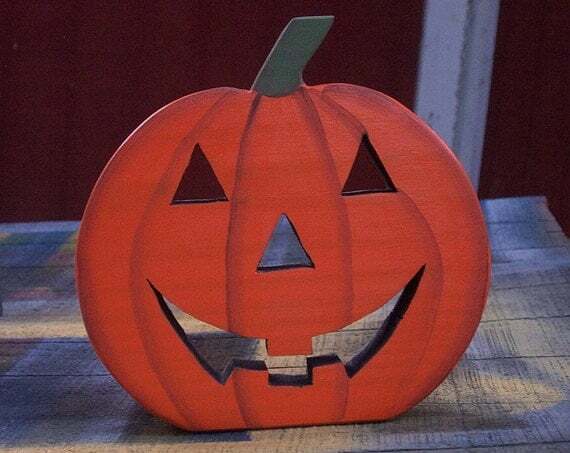 This scary pumpkin measures in at 7 1/2" tall, 7 1/2" wide, and 1 1/2" thick. This pumpkin is made from 2x8 southern yellow pine with several coats of paint and clear coat for durability. Don't hesitate, Halloween is just around the corner. Folksy :: Buy "Chunky Painted Wooden Stretch Bracelet"
Folksy :: "5 Wooden buttons- handmade from Larch wood"